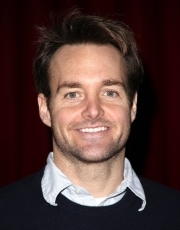 Orville Willis Forte IV, better known as Will Forte , is an American actor, voice actor, comedian and writer best known as a cast member on Saturday Night Live from 2002–2010 and for starring in the SNL spin-off film MacGruber. Forte was born in Alameda County, California, the son of Patricia C. (née Stivers) and Orville Willis Forte III. He was raised in Lafayette, California, and graduated from Acalanes High School and UCLA with a history degree. While at UCLA, he was a member of the Lambda Chi Alpha fraternity. Before joining SNL, Forte was a member of The Groundlings. He has written and/or produced on the television series Late Show with David Letterman, 3rd Rock from the Sun, That '70s Show, and Action. Forte provided the voice of Abe Lincoln and the show announcer on the critically acclaimed but short-lived animated series, Clone High. He was a consultant on another short-lived animated series, God, the Devil and Bob. He made a cameo in the movie Around the World in 80 Days and was in the Broken Lizard film Beerfest. Forte made an appearance on Demetri Martin's album, These Are Jokes and guest starred in an episode of the CBS comedy How I Met Your Mother. Forte is a recurring guest on the Adult Swim comedy program Tim and Eric Awesome Show, Great Job!, also appearing in Tim and Eric Nite Live!, Forte also appeared on The Young Person's Guide to History, a television special on Adult Swim. On March 31, 2009, he appeared on SNL alum Jimmy Fallon's Late Night with Jimmy Fallon. Forte wrote the film The Brothers Solomon, in which he stars opposite Will Arnett . He and frequent writing partner John Solomon wrote some segments for Extreme Movie along with fellow SNL castmember Andy Samberg and The Lonely Island. He appeared in the 2009 film Brief Interviews with Hideous Men, directed by John Krasinski and adapted from the short story collection of the same title. Will had a cameo in the comedy troupe Broken Lizard's 2009 comedy The Slammin' Salmon. Forte guest starred on HBO's Flight of the Conchords as a "semi-professional" actor who poses as a record company executive, as well as on CBS's How I Met Your Mother as one of Barney's co-workers and potential new wingman. Forte has also guest voiced on the American Dad! episode "Family Affair," as a Disneyland security guard. He has also guest voiced in the episode "Every Which Way But Lose," as Mayor Woodside. He also appeared on the Christmas fantasy episode Rapture's Delight with SNL co-star Andy Samberg. Forte appeared in seven episodes of the sitcom 30 Rock ("Black Tie", "Argus", "I Do Do", "Chain Reaction of Mental Anguish", "Christmas Attack Zone", "100", and "Respawn"). After playing a bit part in the first episode Forte returned to the show to portray main character Jenna Maroney's "GenderdysmorphicBigenitalianPansexual" partner, Paul L'Astnamé. Forte lent his voice to Grand Theft Auto IV: The Lost and Damned and played a radio host called "Martin Serious". In 2009, Forte became a regular voice cast member in the Fox comedy series, "Sit Down, Shut Up". He voices Vice Principal Stuart Proszakian, a former prison clown now working as Knob Haven High's vice-principal. The series premiered on April 19, 2009. Kenan Thompson, Kristin Chenoweth, Jason Bateman, Tom Kenny, Nick Kroll, Cheri Oteri, Will Arnett and Henry Winkler are the other main cast members. He also voices Principal Wally, a recurring character on The Cleveland Show. On April 19, 2010, as his MacGruber character, he co-guest hosted WWE Raw with Kristen Wiig and Ryan Phillippe to promote the film MacGruber. Forte guest starred on fellow SNL alum Amy Poehler's third season of Parks and Recreation playing Kelly, a Twilight-loving resident of the fictional town of Pawnee, in the episode "Time Capsule". In the fall of 2010, Forte guest starred on How I Met Your Mother, reprising his role as Randy, a low-level Goliath National Bank employee. On November 10, 2010, Forte began making recurring appearances as a parodic version of TBS founder Ted Turner on the third episode of Conan O'Brien's new talk show, Conan, which airs on TBS. Forte serves on the Board of Directors of the National Policy and Advocacy Council on Homelessness. In 2010, he appeared in a commercial for the United Parcel Service. Whole or part of the information contained in this card come from the Wikipedia article "Will Forte", licensed under CC-BY-SA full list of contributors here.